This French tapestry "Bouquet & Fountain with People" shows a countryside scene of urn with flowers, rivers and foliage with a group of nobles. Here in this work, which is a variation of this classic scene without people, we see the floral still life in the setting of the French countryside in this bouquet au drape tapestry, with some ladies sitting by the fountain. The red drape is seen on the tree branches and pillar, which represents luxury and beauty in French art. The delicacy in the mountains and the river flowing is simply gorgeous in this piece. Full of artistry and detail, this magnificent large tapestry shows the beauty of nature in the countryside. 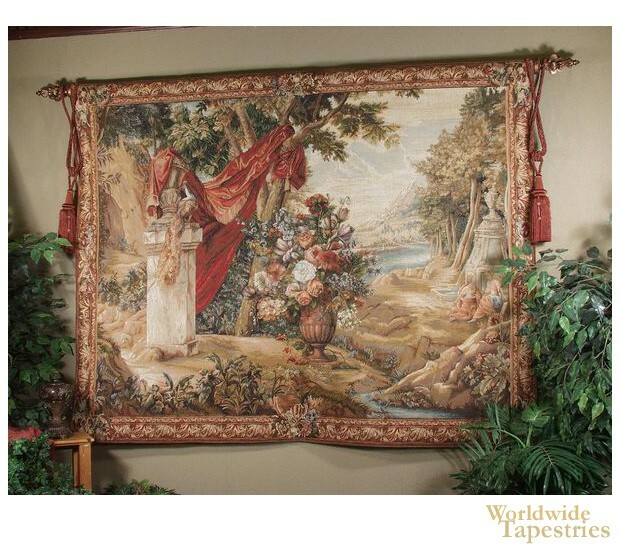 This French landscape tapestry "Bouquet & Fountain with People" is backed with a lining and has a rod pocket for easy hanging. Note: tapestry rod and tassels, where pictured, are not included in the price.